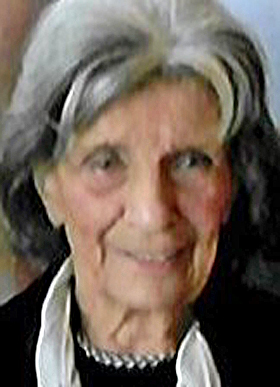 SEBRING — Inez Lalu, 92, of Sebring, died Wednesday at Alliance Community Hospital. Born June 15, 1926, in Huey, Pa., she was the daughter of the late Giacomo and Teresa (Pedrotti) Pederzolli. Mrs. Lalu was a graduate of Alliance High School. She had been employed at Alliance Manufacturing Company and owned and operated White Way Laundromat and Dry Cleaners for 45 years. Survivors include her daughter, Cheryl (John) Berardi of North Canton; three grandchildren; and five great-grandchildren. She was preceded in death on May 14, 1973, by her husband of 27 years, John “Ted” Lalu, whom she married on Aug. 23, 1947. A funeral service will be held at noon Monday at Gednetz-Ruzek-Brown Funeral Home with Father Thomas Dyer officiating. Visitation will be held the hour prior to the service on Monday at the funeral home. Burial will be at Highland Memorial Park in Beloit. Friends and family may sign the guest register at grfuneralhome.com.